The crockpot, or slow cooker, has been a boon to home cooks since the 1970s when it was widely marketed by Rival Manufacturing. The idea, of course, was not new: Cooking stews over low heat over many hours (or overnight) has been around since antiquity, but the crockpot allowed for such meals to cook in complete safety, without using the stove or open flame at all. Yielding its savory contents after many hours, the crockpot is a great timesaver; the concept of unattended cooking appeals more and more to ever-harried lifestyles, but it is a different kind of cooking from the dry heat of your oven. The crockpot conserves the liquid from the cooking food, using it to further braise the contents. It's ideal for recipes that are cooked in sauces. Think about whether your dish will make a satisfying slow-cooked experience. Reduce the amount of liquid used in most oven recipes when using the LOW setting, since the crockpot retains all moisture that usually evaporates when cooking in the oven. Add liquids to sauces about an hour before done. You will normally end up with more liquid at the end of cooking times, not less. A general rule is to reduce liquids by half unless rice or pasta is in the dish. Spices may need to be adjusted. Whole herbs and spices are more flavorful in crockpot cooking while ground spices may have lost some flavor. Add ground spices during the last hour of cooking. Whole herbs and spices will probably need to be reduced by half. Crockpots may vary but generally, the LOW setting is about 200 F and the HIGH setting is about 300 F. One hour on HIGH is approximately equal to 2 to 2 1/2 hours on LOW. 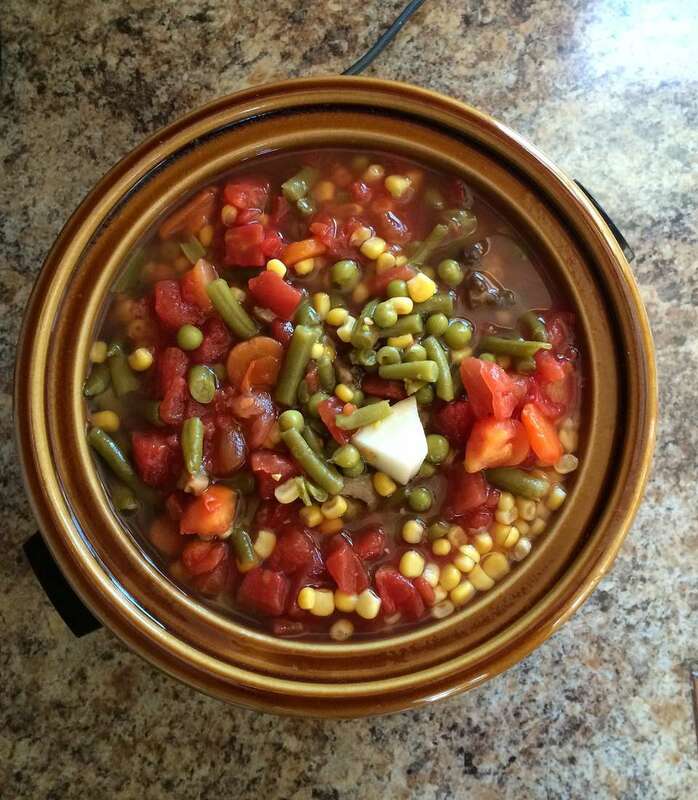 Most crockpot recipes recommend cooking 8 to 10 hours on LOW. Some recipes recommend the HIGH setting based on the nature and texture of the food. You will have to judge your recipe accordingly. Rice, noodles, macaroni, seafood, milk and Chinese vegetables do not hold up well when cooked 8 to 10 hours. Add these to sauces or liquid about 2 hours before serving when using LOW setting (or 1 hour before if set to HIGH). If you want to use milk in an 8 to 10-hour recipe, use evaporated milk. Frozen foods cooking at low temperatures can provide the ideal medium for harmful bacteria. If you use frozen "make-ahead" ingredients in your crockpot, defrost them first. Choose well-marbled meats and dark-meat poultry for best results. Chicken breasts and lean meats will dry out. Browning meats before cooking is a personal choice. It is not necessary, but it will reduce the fat content of some meats. Browned meats also benefit texturally and visually. Sautéing vegetables (like onions, etc) is not necessary, (except for eggplant which should be parboiled or sautéed prior due to its strong flavor). Just add them to the pot with everything else. You may wish to reduce quantities of stronger vegetables since they will permeate the other foods in the crockpot with their full flavor. Layer the pot wisely: Firm root vegetables at the bottom of the pot, meats on top. Dry beans can be cooked overnight on LOW as an alternative to soaking. Cover with water and add 1 teaspoon of baking soda. Drain and combine with other ingredients. Be sure beans are softened before adding to any sugar or tomato mixture. For best results, use long-grain parboiled/converted raw rice in recipes, and use standard liquid amounts instead of reducing the liquid. For mixed recipes requiring pasta, it's best to cook the pasta separately to al dente texture and add just before serving. For soups, add water only to cover ingredients. If a thinner soup is desired, more liquid can be added at the end of the cooking time. The following charts assume a normal oven baking temperature of 350 F to 375 F.
Note: Most uncooked meat and vegetable combinations will require at least 8 hours on LOW.